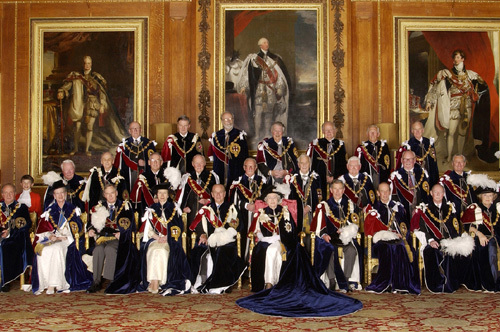 The twenty-five members of the Royal Order of the Garter, founded in 1348, by King Edward III, dine once each year at Windsor Castle, about a round table. From time immemorial, there has been a rule that no two members may be seated next to one another more than once each decade. But can they do better? Uh oh! We stated that if there were 8 members of the order, only two years could pass before some pair would again have to sit next to one another. But, alas, this is not the case! So what’s the answer to the puzzle? For those who don’t believe the solution given in the show, here it is spelled out for 12 years in a row. Feel free to spot check any of the people to confirm that they sit next to all 24 other people. Pretty cool. How do you account for members who die and are replaced by new members? This seemed far too vulgar to ask Lord Butler! But we were wondering too. In general, though the more frequently members are replaced, the easier the job– if all the members were replaced each year, for example, no one would ever sit next to the same person twice.